Plump and chewy, delicious hot or cold, superb in soups, pilafs and risottos, outstanding in pasta, breads and baking—if you’re new to Bluebird Emmer Farro, you’re in for a very special treat. Emmer, Triticum dicoccum, known as farro in Italy, is an ancient ancestor of wheat. It is an incredibly versatile grain with a wonderfully full-bodied flavor and robust nutritional value. Emmer is high in protein—ranging up to 22%— and low in gluten (a chromosome count of 28), making it a great choice for people who are sensitive to more common, hybridized types of wheat. Bluebird Emmer sets the gold standard for this unique gourmet grain. Our emmer is always 100% organic, nutrient dense, sun cured, and milled and packaged to order on our family farm. Emmer was one of the first cereals to be domesticated in the Fertile Crescent and was the primary wheat grown in Asia, Africa and Europe throughout the first 5,000 years of recorded agriculture, more than 17,000 years ago. 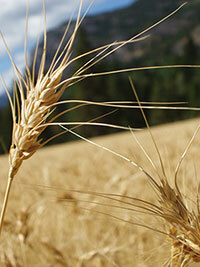 Over the centuries, emmer was gradually abandoned in favor of more productive, hybrid varieties of durum wheat. By the beginning of the 20th century, higher-yielding wheat strains had replaced emmer almost everywhere, except in parts of Europe and Northern Africa, where Bluebird’s seed originated. Petite, soft and slightly sweet with faint vanilla tones, delicious hot or cold, whole or milled, superb in soups, pilafs, risottos, breads and more. With the growing pressures of large industry modifying and hybridizing seed to meet large scale demands a trademark on our Einkorn products is one way our small farm business can communicate to our customers the standards and qualities that our products maintain. Einka® takes us on a culinary journey to the Neolithic age; over 17,000 years ago. It is considered to be the mother grain to Emmer. Wild varieties of Triticum Monoccocum can be found in Bulgaria and other parts of Eastern Europe. Similar to Emmer, Einka® is rich in protein, phosphorus, vitamin B6, potassium, antioxidants and amino acids. Einka is rich in protein-ranging up to 22%- and low in gluten with a chromosome count of 14. Our Einka® is 100% organic, nutrient dense, sun cured, stored onsite, and milled to order on our family farm. Tangy, earthy and satisfying, rye can be cooked whole, cracked as a cereal grain, or milled for breads. Blended, rye and emmer flour make a full-bodied, nutritious loaf of bread reminiscent of old-world baking. 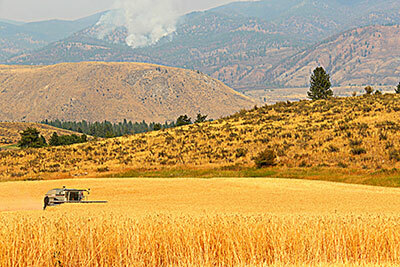 Our Heritage variety of Rye, Tetra Pectas, is a unique and rare variety of Rye rooted in Eastern Washington for over 100 years. We have not been able to source this variety anywhere else in the United States. Treebeard of Raintree farm of Tonasket, Washington kept this variety alive for over 30 years before passing it along to us. Rye’s large, plump, steel- blue berry contains fiber both in its endosperm and bran. It has a lower glycemic index than modern wheat and is especially healthy for diabetics. The type of fiber in rye promotes a rapid feeling of fullness. Rye is not wheat, but closely related. It is in the grass family. 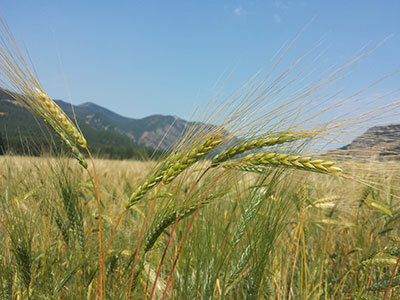 Domesticated rye has been traced to Neolithic sites in Turkey. 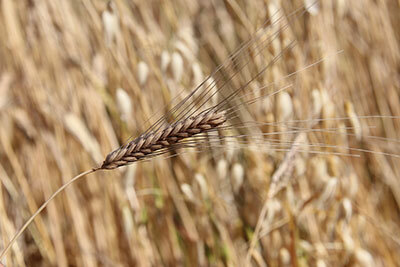 Rye may have been cultivated in central Europe as early as 1800-1500 B.C. It has been feeding Eastern Europe since the middle ages..
Long seen as a weed in more desirable wheat crops, rye eventually gained respect for its ability to grow in areas too wet or cold for other grains. This has made it a traditional food in Northern Europe and Russia. Rye was also widely grown in colonial America. A plump and chewy, high protein spring wheat berry with bitter undertones. Used in salads, soups or ground into whole wheat flour for yeast breads and other delicious baked goods. Our Methow Hard Red Wheat, Triticum aestivum, is an open pollinated variety of red wheat originating from Northern Canada over 100 years ago. 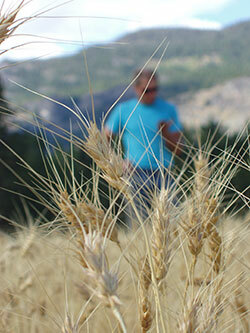 Our Methow Red wheat ranges from 12.5%-14% protein and has stronger-tasting tannin than white varieties of wheat. It is used as a whole grain berry for soups and salads or is milled to order as your classic “whole wheat bread flour”. It’s slightly bitter flavor gives bread a rich whole grain taste. A plump and round spring wheat berry with a mild gentle flavor and high protein content. Used in salads, soups or ground into whole wheat flour for yeast breads and baked goods. Our Pasayten Hard White, Triticum aestivum, is an open pollinated wheat berry that has close ancestry to Hard Red Spring wheat. It is attractive to bread bakers for its mild flavor and high protein/gluten content. White spring wheat has a slightly higher gluten content and softer endosperm than our Hard Red Wheat allowing it to “fleck” or mill in a fine grind. This property allows Hard White Wheat to have more all-purpose use in baking. We call it our “whole grain all-purpose flour”. Because we operate under an intensive organic farming system, we plant a variety of cover crops such as Flax, Buckwheat, Mustard, Clover, Vetch and Peas. 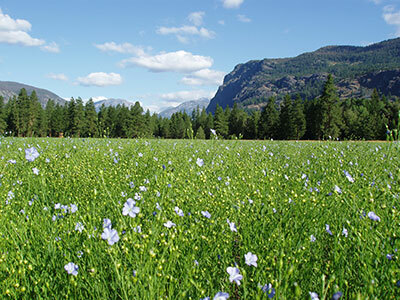 Cover crops are planted during the spring and tilled into the soil before they set seed. Cover Crops are considered a “green manure” to increase soil fertility for the next year’s growing cycle.